How did the rise of capitalism in England affect those communities whose lives were not previously dominated by the capitalist mode of production? What did the ruling class need to do to ensure that private property was protected from those who had little or none? How did people try to resist, or adapt to these changes? These are the important themes in Christopher Hill's book Liberty Against the Law. Hill argues that for capitalism to develop the system, or rather those within the system who governed and ruled it, needed to put in place a set of laws and regulations that undermined old traditions, laws and customs which dated back to "time immemorial" and impose a new set of rules that better fitted the new order. An infamous example of this, studied at length in a number of chapters here, was the 1723 "Black Act". This Act criminalized poaching and severely restricted the rights that the rural population had to utilize the free nature that was around them - from the hunting of deer and rabbits to the wider use of the forests. 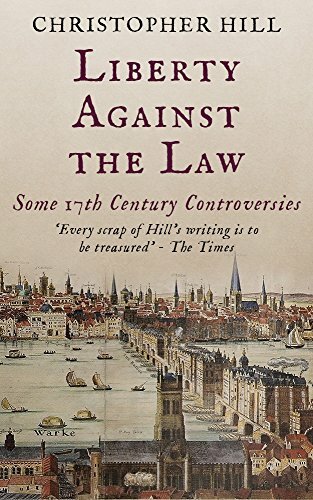 This act, Hill argues, was "part of a single policy, consequent on Parliament's victory of 1688-9, of making the world safe for English merchants and landlords to increase in wealth and so to contribute to the new power of the English state". The victory of Parliament over the Crown was crucial as it meant that the new ruling class, dominated by the interests of merchants and landowners, could set about constructing a new order that benefited them and as Hill argues, "the most important liberty to be defended was the sanctity of private property". But while Parliament changed laws that benefited those with property, it refused to abolish those rules that hit the poor. Parliament refused to abolish tithes; big landowners voted security of tenure for themselves by abolishing feudal tenures and the Court of Wards but specifically refused to grant similar security to copy-holders. 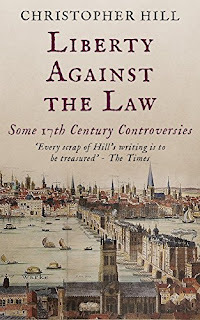 Such changes in the law as occurred between 1641 and the early eighteenth century increased popular hostility towards it. Why should the lower classes respect laws which asserted property rights against traditional popular customs in the villages? At the same time, the countryside was being transformed in the interest of capital and landowners. Enclosure was consolidating land into the hands of the wealthier section of the population. Peasants were being driven off their traditional lands and common rights were being destroyed. Villages were increasingly polarised. Not everything was down to economics, but all of it had a common aim, the recreation of society in the image best suited to capitalism. Acts enforced a particular type of marriage, over the relative freedom hitherto enjoyed by the rural poor. Nature was commodified, land parcelled up. Resistance took many forms. Riot, protest, petition were all common, as were songs and ballads that denounced the new order. Radicals interpreted the bible and then fought for the right to worship in their own way. Pirates replaced the violence and terror of the Navy with the liberty and democracy of self-organised vessels. Smugglers (poor man's pirates) avoided tax and helped keep prices low for the poor. Poachers risked judicial murder to provide cheap meat for their families and communities, and on occasion, fought pitched battles with the hired thugs of capital. Hill studies all these groups and charts popular attitudes through the poetry, plays and songs of the times. It's a fascinating examination of the period, perhaps merely a century in length, when the capitalist state was created and consolidated.